A Year Without ‘Made In China’! 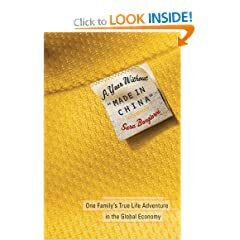 A Year Without ‘Made In China’ – One Family’s True Life Adventure in the Global Economy, is a book by Sara Bongiorni that was an eye-opener for me! Sara and her family kick start 2005 with a New Year’s resolution not to buy anything made in China. She called it a fascinating and frustrating journey and the book takes us along on the journey. I love this book. Sara Bongiorni is a wife and mother of 2 children. Imagine trying to find toys for the kids and boycotting China at the same time. If you start looking around your home right now, it will scare you the amount of products that have come from China. Think about it. Mattel has recalled toys made in China because they were unsafe, infant milk formula made in China has been recalled because of taining with chemicals, candy has been recalled because Melamine has been found, and who can forget that Walmart had to pull pet food made in China. Oh, and by the way, while other nations were boycotting products made in China, Canada was trying to convince its people that products made in China are safe! Yet do you know anyone that pays attention to the ‘Made in China’ products. I have one friend, Judy, who has been boycotting China made products for about a year. We call ourselves a safety conscious society but yet parents still line up at Wal-Mart to buy everything from pet food to children’s toys… In this age of information and fast-paced technology, have we not learned anything if we are willing to put our loved ones at risk to save 10-cents? Food for thought! (Is the food made in China though?) Buy this book! This entry was posted on May 18, 2009 at 11:30 pm and is filed under Uncategorized. You can follow any responses to this entry through the RSS 2.0 feed. You can leave a response, or trackback from your own site. I, too, have been careful not to buy anything made in China. It has meant doing without things I would like to have, and there have been several items I really need but have done without. Items made in China are not only unsafe, but our “paid” representatives, President and Congress, need to think seriously about all the jobs that we have lost because of China and other countries. Seems to me we are now owned by China, and I do not like that.